Manila Philippines—April 13, 2019—Honda’s Dream Team racers stay on top of their leagues despite Marc Marquez, reigning world champion of Repsol-Honda, fell short of 0.023 seconds behind Andrea Dovizioso, while fellow Honda teammate Cal Crutchlow emerged third during the MotoGP Round on Sunday. Marquez raced against Dovioso over 22 laps as team member Cal Crutchlow tailed closely behind during the tilt held at Losail, Qatar. Both showcased strong races despite injuries attained the previous year, with Marquez having an operated shoulder and Crutchlow breaking his ankle in last October’s Australian Grand Prix. The race finished in a similar fashion to the previous year’s Qatar Grand Prix. Marquez ran wide when he tried passing Andrea to reach the finish line. Preparations for the MotoGP race were grueling, especially that Marquez had his first ride on a MotoGP bike after undergoing surgery for his left shoulder last December as tropical temperatures in Sepang reached 60 degrees every afternoon. Crutchlow, on the other hand, displayed confidence this season despite having an injury that caused minor swelling in his ankle. Meanwhile, other Honda racers also bagged big wins. Kaito Toba of Honda Team Asia emerged the Moto3 World Championship making him the first Japanese to win the event. He swept ahead of the Italian Dalla Porta and Poleman Aron Canet, grabbing the checkered flag with a speed of 0.053 seconds. Toba started out from the middle but recovered in the lead group. The lead was changing every lap and Toba used the slipstream effect to his advantage. The Japanese rider tucked his head down and found himself in a three-way fight with Dalla Porta and Canet for the win. Toba then took full advantage of the slipstream and powered past the others to take the flag in P1. Dalla Porta settled for P2 and Canet with Max Biaggi stood for third at the podium in scenic Qatar. Rider Md Zaqhwan Zaidi of Honda Asia-Dream Racing with SHOWA Team is the winner of Race2 held in Sepang Malaysia on March 10. The team initially had problems with the machine during Race 1 and made sure that everything worked well for the second round to win. Ambient temperatures hit a sweltering 34 degrees Celsius for Race 1, covering the track with 61.8 degrees. 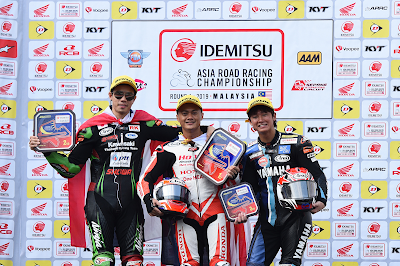 Keeping his cool, Zaidi and Apiwat Wongthananon of Yamaha tried to keep up with Thitipong Warokorn of Kawasaki and Azlan Shah Kamaruzaman of BMW. The leading riders were evenly spaced for the first half of the race but Zaidi’s bike took him off track during a struggle for third place. Race 2 saw rains drenching down temperatures to 35 degrees. Fast clouds eventually pounded torrent as Zaidi kept closing on the lead rider, keeping a gap of more than three seconds into the final lap. Zaidi took first while Warokorn finished second. Md. Zaqhwan Zaidi is the ace rider of the new team formed through Honda’s Asian subsidiaries joining forces with Showa, a manufacturer of high-performance automotive, motorcycle, and outboard suspension systems based in Gyoda, Saitama. Honda’s Asia-Dream Racing competed in the Asia Road Racing Championship’s new ASB1000 class. Former MotoGP Makoto Tamada led the team and was also responsible for spreading motorsports across the Asia region. Both Zaidi and Tamada have worked hard to succeed in the new class after being involved in the JSB1000 class in Japan last season. Honda Motor Company, Ltd. presented a dream team of racers whom all did their best amidst injuries and harsh climate. The motorcycling company has consistently refined its technological and human resources in sharing fun and inspirational moments with its customers through joyful experiences.